It’s hard not to be inspired to get on two wheels when you watch the likes of Marc Marquez and Valentino Rossi flying around a track at 200mph. Motorcycle racing, unlike other sports, like football or rugby, the path to MotoGP isn’t an obvious one however we’re here to show you the way to stardom and Sepang. First, you need to know what you’re signing up for. Road racing isn’t tearing around streets with your mates at night, it refers to all-tarmac surfaces on permanent circuits and temporary street circuits. For this you need a Road Race Licence, something that will set you back £52 and is valid from the date of issue until the end of the year. The good news is there are hundreds of racing clubs around the UK and they’re spread right across the country. There’s no way around this and you will need a club official to sign your licence application however they will normally do this as soon as you apply to join their club. Once you’ve got a club membership you can apply for an ACU licence, arguably the most important aspect of getting into racing. The ACU is the UK’s governing body for motorcycle sport and is recognised by the Federation Internationale Motorcyclisme (FIM) – the organisation responsible for MotoGP. 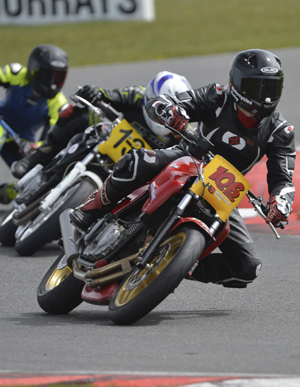 It’s remit is to oversee motorbike racing in the UK and provide members with the opportunity to get involved in motorbike racing, regardless of ability and without discrimination. For anyone wishing to gain an ACU licence, you need to complete a Competitor Training Course (CTC), which is classroom based, and an ACU Basic Rider Assessment, a practical assessment of rider ability. Once you have finished your CTC and Basic Rider Assessment, you can send your application for a Road Race licence to the ACU. You will also need to include an eyesight report and a unique code from your riding club. After you have secured this you will receive a Novice or Intermediate Novice licence. Novice – This is the first level of licence and does not require a motorbike licence however you are restricted to 600cc bikes. You must wear an orange bib with a novice licence. Then it gets complicated. You need to complete at least one race, at 10 different meetings on three or more different circuits. Once you have done that you can then upgrade your licence. For this licence you need a full motorbike licence and you can ride any capacity motorbike. You need to wear an orange bib again and the qualifying period to complete before moving to up to Clubman is the same as for the Novice licence. Once you have completed the qualifying period and races, you can move up to a Clubman licence. To achieve a Clubman licence you need to have completed 10 races at three or more race circuits. On completion of each of the ten races you must obtain a signature to say you have completed each race. You can then ditch the orange bib (yay!). It is much more difficult to gain national status as it measures performance as well as completing laps. You must finish within 110 per cent of the time of the first placed motorbike in your class in 10 more races. You also need to race at four circuits, rather than just 10. Age limits – As there is no requirement for a motorbike road licence to move up the racing licence ladder, there are a wide range of ages among motorbike racers however 11 is as young as it gets for an ACU licence. There are lots of different classes and engine sizes that you are able to race in, ranging from 125ccs all the way to 1200cc beasts. If you have an Unrestricted A Motorbike Licence, you can ride in any class, dependent on your ACU licence. But even without a full Unrestricted A licence you can get a Road Race licence, however your age then comes into it. To see a full breakdown of the age limits and the bike sizes that you can ride, follow the link. The club you have joined will send you updates on the meetings and racings they are holding. This correspondence should include entry-forms that you will need to fill in and return before the closing date. Once you’ve done all that you can get in the saddle and pit yourself and your bike against others. This doesn’t mean practice screaming around suburban roads with the throttle maxed out, it means track days. Try to do a few at least before you get on the start grid! And who knows, you could be at Sepang flying past Marc Marquez within 10 years. Alternatively, you might not come last in a race at Mallory Park, we can’t help you in terms of talent! You can see what The Bike Insurer’s Lewis Osler has to say about getting into racing. He’s someone who should know, having raced in the Thundersport paddock for the past five years.